Made by my dear wife Karen. Those trips to the Outer Banks of North Carolina and Myrtle Beach, S.C. that my dear wife Karen has taken with her great friends for those Girls Getaways in summers past paid off for my tummy this winter. She got a hankering for a dish she likes to order down there in the southern region of our United States of America. Shrimp ‘n Grits doesn’t show up in many joints around our Little Bitty in the Syracuse city neighborhood of Eastwood. So Karen dug around for recipes, went to the right specialty shops for the proper sausage, and whipped it up her ownself this past weekend. Yes. My first encounter with this heavenly southern specialty went very well indeed. I’m familiar with all the parts separately. I consider myself a fan of andouille sausage and shrimp and peppers and onions and grits, too. My dear wife chopped, sliced, put them together and spiced it just right. And the texture of the grits was perfect. They were thick enough to hold their own against such a culinary onslaught but without a clump to be found. My iPad Air shot of the bowl I ladled out for myself turned out blurry, for some reason, so I went back the next day to shoot the leftovers — scant as they were after my enthusiastic onslaught. Of course, that state of cold from the fridge doesn’t do the texture true justice. I guess you’ll just have to trust me on this one. As I was washing the dishes after our meal, Karen remarked sympathetically there were more than usual because of the many steps of preparation. “Worth it!” I quickly replied, happily scrubbing. 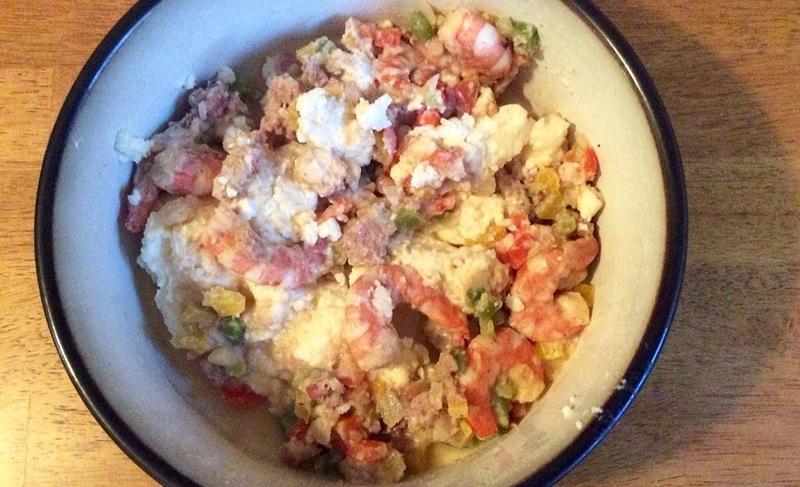 Have you ever tasted Shrimp ‘N Grits, and if so, where did you eat them and what did you think? Have you ever cooked this dish, and if so, do you find it a tough make? If you’ve never tasted this combo, would you if you found it on a menu? How do you top off a five-beer afternoon? That sounds delightful, fu fu and all, Van! Ah shrimp and grits. A happy little dish. So many different variations it is a bit like Gumbo or chilli;in that there is no wrong way. Also a great dish for breakfast. That’s another reason to doubt my true heritage as a Southerner, not liking grits in addition to sweet tea and pecan pie. I’m a misplaced Yankee, I think! You’re welcome up here to drink unsweetened tea with me any time, J! With the size of your family, you bet, Gatorette! I love grits. I make em and eat em at least once a week. We have some really good shrimp at grits at a pub here — they’re fantastic, and pretty much all I order. Lucky you in Indy, there, Joey! Yum indeed. Looks yummy. I only had grits once, when I was living in DC, and I hated that dish. Possibly, it wasn’t prepared properly, as I understand grits must be cooked just so. I do like whole hominy, however – cooked up in lots and lots of real butter. And I absolute love shrimp, pretty much in any dish. I think there’s lots of room for error in grits, CM, particularly texture-wise. But, yes, butter is perfect in hominy with all food. Ha. I have never had grits and have always wanted to try them. Hominy here in the southwest goes right into Psole’! Now THAT’s yummy! Now that’s a regional dish I’ve yet to discover, PJ. Someday? It is hominy corn soup made with either red chili or green chili and pork. Delicious! Ok, I think I might still have your email. If I do, I will email you the recipe. It would be great for the big game day! If you ever want the recipe to try it, let me know and I’ll send it to you. Psole’ is a favorite New Year’s dish in the southwest. Yes, I bet my dear wife Karen would love to give it a try! I guess I don’t have your email address anymore. Can you send it to me? Nevermind, I found your email address! Hope you got the recipe! Grits remind me of the Cream of Wheat of my youth, Beth. Maypo, if you recall the brand name that yielded a nickname for this young Markie. I’m not always a grits fan but on a recent trip to Charleston, I had what could only be described as “gourmet” grits. Phenomenal. And I’ve been dying for them ever since:). I have a feeling those gourmet grits were gussied up pretty good down Charleston way, Kay. Sounds exciting to me! Looks great 😊 I’m not a seafood-eater so have never had shrimps. Happy 2016, Mark! I eat salmon and general fish, just not the creepy crawly ones that have shells and tentacles and claws etc 🙂 no thank you, not for me!